Discussion in 'Articles' started by AfricaHunting.com, Feb 1, 2008. 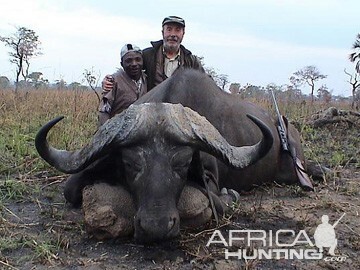 I have guided and hunted over 500 Buffalo in Tanzania and confirm that each trophy is unique. I was brought up hunting old animals and from a very early age have instinctively judged every animal on wear & tear before judging size. Nothing like taking an old animal and working for it. They rarely come easy and as the saying goes - its the clever ones that grow old. 01. Old Trophy Dugga Boy! 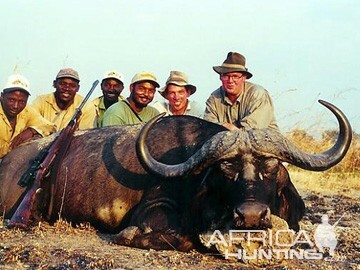 These Cape Buffalo below are not 'young' bulls, the reason I judged them as immature is due to the fact that they would most likely not be shooters on a Buffalo safari. On the close-up photo, it may appear that they have hard bosses, but they are actually just beginning to form a rough layer at the top. If you were to press your thumb on these bosses (where they meet together), you will find that the top crust will move down upon pressure, meaning that the bottom of the bosses is yet to fully form. Forum, to read the full thread click here. 03. 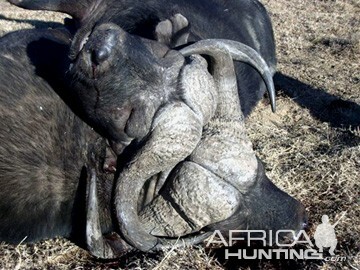 Close up of the two Cape Buffalo. Further evidence is from the facial features. There is no typical wear and tear on the ridge of the nose and the 'tear-path' from the eyes. The facial hair is very intact which is not a rule, but very common among old bulls. Furthermore, you will note that the horns are still angling backwards (also not a rule but common of younger bulls) plus they have 'flick-back' tips which suggest little wearing down. On the close-up, the bull facing left is the older of the two and may in some places qualify as a last day bull, but it is not an appropriate bull to take down. Even though they are alone, it does not mean that they are old bachelor bulls. 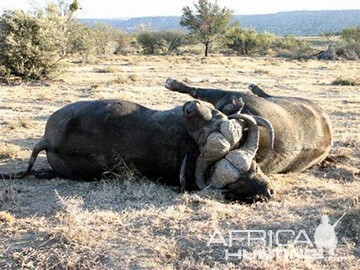 Buffaloes also enjoy young bachelorhood and then rejoin a herd when they are ready to fight for breeding rights. Indeed, it is impossible to judge when a wild Buffalo has 'peaked' or is in 'decline', but we all depend on the tell-tale signs. I have seen some really old bulls still hand around the herds and even sniff a cow or two and have seen very young bulls hand around with old dugga boys - there is no fixed rule to these habits. But in the case of the two candidates on the photo above, they would deserve a second and third glance maybe, but if the area has Buffalo, then they are to be left alone for a future date. In reference to the 'seam of the bosses coming together', that is another misconception that many hunters have. The distance between one boss and the other is very much a genetic quality and cannot be used entirely as an age indicator. It is the HARDENING of the bosses and COMPLETE formation of the bosses according to the genes of that particular bull that safely establish whether a bull is mature or not. They could be close together or up to six inches apart. A few photos here below to illustrate various boss genetics - one meets at the seam, another is 2" apart and the other 3" apart - but they are all as old a bull as you could hope for. 06. Old Trophy Dugga Boy! I admire hunters who seek exceptional trophies and encourage the practice, but in my book, a young animal, unless harvested for special reasons, is no exceptional trophy. Stay true to ethical hunting and let the young ones develop to their full potential while keeping the population sustainable. Judge your hunting before your potential trophy. 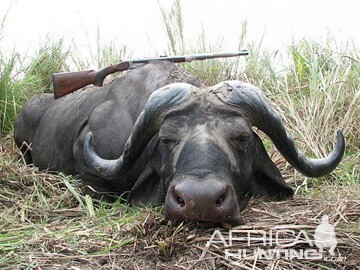 Using Rowland Ward Methods Of Measurement for horns of African Buffalo (Method 12) does require taking the spread measurement from horn to horn into account. 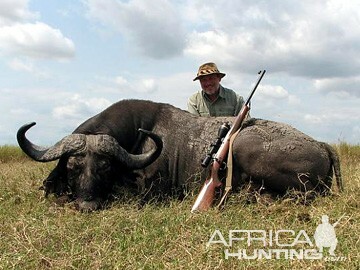 Using Safari Club International Methods Of Measurement for horns of African Buffalo (Method 4) does also require taking the spread measurement into account. predators and watering & grazing locations. of boss development and very slim features. 15. A very young bull. Probably between 4-5 years at the most. a spread of + 40 inch (101.60 cm). the extent of the dimensions can be judged. his good genes and possibility of still being a reproductive bull. has gained in spread, he has lost in drop and curl. 21. 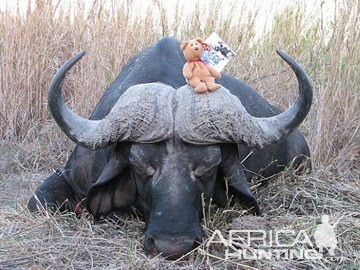 Here is a bull that is a classic trophy to any Buffalo hunter. though – you shoot behind the shoulder and you are in trouble. lungs and do damage to the boiler room. ever in doubt about its’ gender and age, look between his legs!!! of this old warrior – do him a favor and take him as a trophy. He is a fine old bull who is past his prime. can tell that you are not the only one he has dealt with recently. Hunting any wild game is a thrill and adventure. 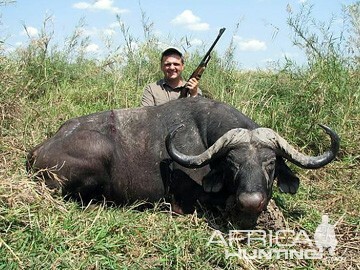 But there is something about the Cape Buffalo that just stands out and makes it a unique experience. 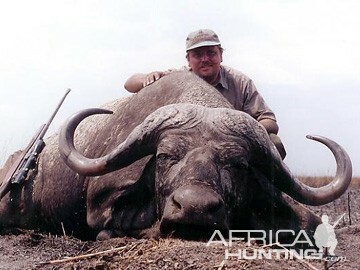 It is not a hunt above the rest, as all dangerous game hunts are special, but the Buffalo is game that a real hunter never tires of pursuing and no two hunts for this great animal are the same. The fact that it is a species that is in abundance also adds to the experience, knowing you can meet the challenge again and again. 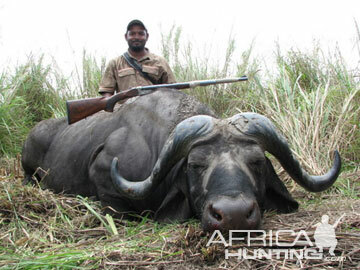 Lion / Leopard / Elephant / Rhino are mostly once in a lifetime hunts, but the Buffalo is a lifelong hunt. 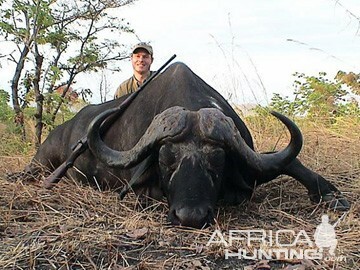 Even getting lucky with a 50" trophy will not exhaust your thirst for another Buffalo hunt. 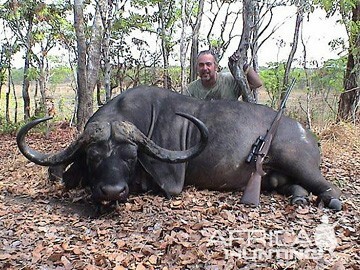 Buffalo hunting is an incurable fever. Karibu Tanzania.